Like all aspects of the digital industry, digital marketing is ever evolving, with the likes of social media, Google’s advancements and SEO all now part of the everyday digital business. Growing with the digital industry is the need for more complex digital marketing and with more marketing comes the need for more measurements to track the performance. 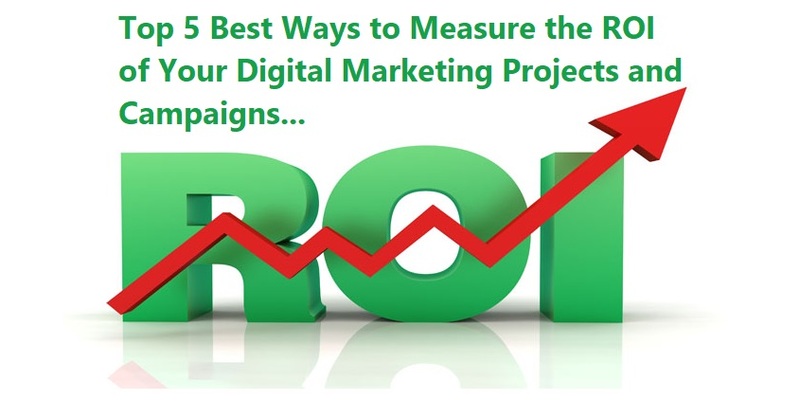 Today, we will discuss Top Five Best Ways to Measure the ROI of Your Digital Marketing Projects and Campaigns. For any marketing campaign that you create and put forward it is vital to track its performance and measure the ROI (Return-On-Investment) of the program. It needs to be seen that your efforts are bringing back revenue into your business in order to determine whether those marketing methods should continue. But is it as simple as just finding out what works and by how much? No. There are challenges to measuring your marketing campaigns performance. First of all, it’s a task to know when in the campaign to measure, revenue from marketing can come back at any time for your business but you can’t always wait until the results are there to measure. Next, knows where in the marketing cycle is best to be measured. The first instance you advertise? The follow-up sales conversions? It’s important to know where the revenue can be linked to. Then you have to bear in mind that each individual responds differently to different marketing strategies so it can be difficult to measure which strategy had the most impact. Lastly, there will always be unforeseen factors that will influence and affect your marketing so separating these from what part of the campaign really drove revenue can be difficult. You can also hire online digital marketing agencies like Hopinfirst and many others to run and manage your marketing projects and campaigns effectively. So, when it comes to documenting your ROI, what are the best ways to measure? The most common method of measuring results. Can be measured on a first or last point of the deal. Gives all credit to a first or last point of contact in a marketing program. Builds on single attribution results by predicting long-term revenue outcomes. Uses history of ROI to predict new results. Takes into consideration the impact the marketing will do going forward. Focuses on quality and not quantity. Looks at multiple points of impact throughout marketing campaigns. Measures individual contribution of each point of impact. Creates an ‘action timeline’ of influence leading to total revenue. Different ‘weights’ can be added to different aspects depending on the type of marketing. Doesn’t just focus on lead generation. Useful for long campaign cycles. Takes into consideration all associated with deal not just first or last point of marketing. Tests how effective a marketing program is by measuring it against a control group. When you apply the marketing strategy to one half of your group you will be able to measure the differences and evaluate how effective it is. A very open method to test and measure any aspect of your marketing. A very technical view of measuring ROI. Can work out quite a low cost. The most complex and least widely used method of measurement. Looks at the sales outcomes of your marketing campaign against various factors using statistical equations. Can be costly, as a lot of time and effort needed to collect data on various factors of the program. A Very accurate method as it measures the impact of all program factors and external factors in one go. Looks at effectiveness and efficiency across all boards.